Europe is currently basking in the temporary calm of official reassurances and half-measures. The calm won't last long. Two of the more interesting dynamics at work in our world are geometric growth and stick-slip events. Geometric growth (or progression) is also known as exponential growth, where the initial phase accelerates into a steep rise--the famous "hockey stick." Exponential growth is unsustainable and either levels off or crashes. Stick-slip events are of interest because the pressures that lead to sudden, unpredictable rupture are hidden from view. All appears well until the catastrophic break in the Status Quo. Earthquakes are one example: pressure along a fault zone builds to a point that stability becomes instability, and the tectonic plates suddenly slip into a new equilibrium. The eurozone is currently in Phase II, basking in the temporary calm of official reassurances and half-measures. Notice that the crisis level, the pressures building beneath the surface, are significantly higher than the initial crisis phase. 1. An inherently unstable currency that the Powers That Be in Europe are attempting to stabilize by brute-force money-printing and public-relations artifice. 2. The European model of generous social welfare is breaking down for demographic and financial reasons that are independent of the euro currency crisis. Two workers cannot support one beneficiary, and no state or aggregate of states can borrow enough to mask this reality for long. Financialization and the build-out of China provided Europe the illusion that the worker-to-retiree/beneficiary ratio could fall to 2-to-1 and be maintaned indefinitely. Now that the fast-growth phase of China's build-out has ended, and the disastrous consequences of financializing everything under the sun are apparent, the illusion has run aground on fiscal reality. Expectations that have been raised to unrealistic levels for decades are now in the process of being adjusted down to reality, and everyone who felt entitled to promises that cannot be kept is angry, frustrated, disillusioned and seeking a scapegoat for processes that are running entirely independent of the leadership of the moment. How long will this false calm of official reassurances last? 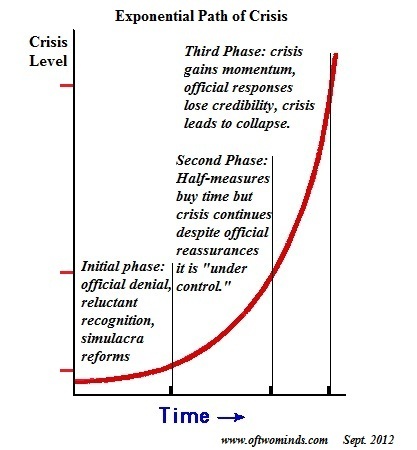 Nobody knows, but if crises track an exponential curve like so many natural dynamics, the next phase of the Eurozone crisis will quickly reach escape velocity and accelerate beyond the reach of politicos and PR. My apologies to email correspondents: I am under the weather and unable to maintain my usual workload. Thank you, Edward D. ($100), for your outrageously generous contribution to this site-- I am greatly honored by your support and readership.